"You need a bit of....Oh....Shock Treatment"
Richard O'Brien had planned a sequel to The Rocky Horror Picture Show, what he and us got however was Shock Treatment. More of a 'futher adventures of Brad and Janet' than a true sequel to Rocky (Richard has been writing a true sequel on and off since July 2000). 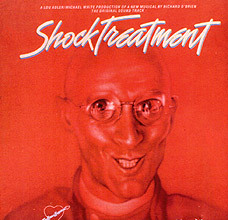 Having said that Shock Treatment is great fun and packed with some great musical numbers, again by Richard O'Brien and Richard Hartley. The movie featured five actors from The Rocky Horror Picture Show, Richard O'Brien himself as Cosmo McKinley, Patricia Quinn as Nation McKinley, Nell Campbell as nurse Ansalong, Charles Gray as Judge Oliver Wright and Jeremy Newson reprising his role as Ralph Hapshatt. It also features Rik Mayall, Ruby Wax, Cliff De Young as Brad and Jessica Harper as Janet. Barry Humphries plays Bert Schnick. The whole film is a parody of American TV culture, with the entire movie set in a huge televison studio (actually in Wembley, Middlesex. An actors strike meant that the production couldn't take place in Texas as planned). The plot revolves around the break up of Brad and Janets marriage, Brads long lost brother and his fast food to mental health empire, and I could go on but really it makes sense when you see it! However if you like a rock driven show album, then this you'll love. From the theme song 'Shock Treatment' to the heavy 'Breaking Out' track the album rocks along. You do get the occasional softer track with Janet's "Looking for Trade" and the wonderfull "Lullaby" prime examples.